Health and safety, first aid and emergency medical care are more than just legal requirements for businesses in the UK. They make the difference between a life being lost and a life saved. By law an employer has a duty to provide the necessary training so that first aid can be provided to employees if they are injured or become ill at work. ResusPlus Training can provide on-site training to enable your organisation to meet the requirements specified in the Health and Safety (First Aid) Regulations 1981. First aid training for businesses provides an essential level of knowledge and skills to your people allowing them to condently save lives in times of emergency. 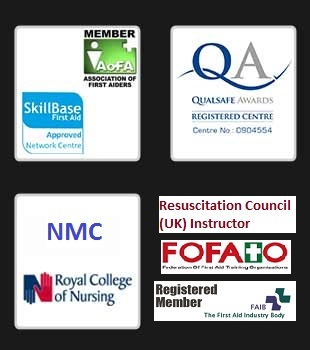 ResusPlus Training is based in Northamptonshire and provides all types of on-site first aid, CPR and defibrillator (AED) training courses to meet the needs of your company, organisation or group. This course is suitable for any business or group who require an approved level of minimum first aid training. Our CPR, AED and First Aid courses are interactive and engaging way for people to learn the fundamentals of Basic Life Support. First aid at work (three days) is an HSE approved course for nominated workplace first aiders, or anyone wanting a comprehensive introduction to first aid. A training course for candidates that have completed a previous 3 day First Aid at Work course. Candidates attending this course must hold a First Aid at Work certificate that is either still current (up to 3 months) or due to expire within 28 days. After this expiry date, the candidate would need to undertake a 3 day initial First Aid at Work course again. Thank you so much, the resuscitation training was invaluable, clearly presented and just the right length to enable us to find a window in our busy professional diaries. We will certainly be looking to you in the future to keep us updated and will recommend you to other colleagues.